The annual reports provide examples of activities. International Medical Corps. Annual Report (2009) (PDF). International Medical Corps. Chad. http://www.internationalmedicalcorps.org/Page.aspx?pid=353 (accessed January 11, 2011). Archived by WebCite® at http://www.webcitation.org/5veuTOgG1. International Medical Corps. Cholera Outbreak in Haiti. http://www.internationalmedicalcorps.org/Page.aspx?pid=1345 (accessed December 21, 2010). Archived by WebCite® at http://www.webcitation.org/5vC83fECr. International Medical Corps. Clean water, sanitation, and hygiene. http://www.internationalmedicalcorps.org/Page.aspx?pid=315 (accessed January 11, 2011). Archived by WebCite® at http://www.webcitation.org/5vevN6ocb. International Medical Corps. Darfur. http://www.internationalmedicalcorps.org/Page.aspx?pid=355 (accessed January 11, 2011). Archived by WebCite® at http://www.webcitation.org/5veuZtnva. International Medical Corps. Emergency response. http://www.internationalmedicalcorps.org/Page.aspx?pid=311 (accessed January 11, 2011). Archived by WebCite® at http://www.webcitation.org/5vev94U9Y. International Medical Corps. Financial reports. http://www.internationalmedicalcorps.org/Page.aspx?pid=286 (accessed January 11, 2011). Archived by WebCite® at http://www.webcitation.org/5veqT2BcN. International Medical Corps. Haiti 6-Month Report (PDF). International Medical Corps. Haiti: One year later (PDF). International Medical Corps. Haiti one year after the earthquake. http://www.internationalmedicalcorps.org/Page.aspx?pid=1867 (accessed January 11, 2011). Archived by WebCite® at http://www.webcitation.org/5veqJ8U92. International Medical Corps. Haiti Updates. http://www.internationalmedicalcorps.org/Page.aspx?pid=1113 (accessed December 21, 2010). Archived by WebCite® at http://www.webcitation.org/5vC7ncOhs. International Medical Corps. Health capacity building. http://www.internationalmedicalcorps.org/Page.aspx?pid=312 (accessed January 11, 2011). Archived by WebCite® at http://www.webcitation.org/5vevCoj4B. International Medical Corps. Homepage. http://www.internationalmedicalcorps.org/ (accessed January 11, 2011). Archived by WebCite® at http://www.webcitation.org/5veqcKTDj. International Medical Corps. Mental health. http://www.internationalmedicalcorps.org/Page.aspx?pid=313 (accessed January 11, 2011). Archived by WebCite® at http://www.webcitation.org/5vevJ22or. International Medical Corps. 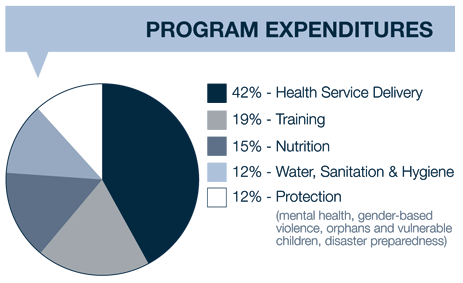 Priority Programs. http://www.internationalmedicalcorps.org/Page.aspx?pid=394 (accessed December 21, 2010). Archived by WebCite® at http://www.webcitation.org/5vC88g7RM. International Medical Corps. Our approach in Haiti. http://www.internationalmedicalcorps.org/Page.aspx?pid=1102 (accessed January 11, 2011). Archived by WebCite® at http://www.webcitation.org/5veqMMNF8. International Medical Corps. Where We Work. http://www.internationalmedicalcorps.org/Page.aspx?pid=492 (accessed December 21, 2010). Archived by WebCite® at http://www.webcitation.org/5vC8BO2eK. International Medical Corps. Women's and children's health and well-being. http://www.internationalmedicalcorps.org/Page.aspx?pid=314 (accessed January 11, 2011). Archived by WebCite® at http://www.webcitation.org/5vevFeyrN. 1. "International Medical Corps had raised roughly &dollar;3.2-million as of Monday." Chronicle of Philanthropy, "A Roundup of Haiti Fund Raising as of January 29." 6. Chronicle of Philanthropy, "Haiti Earthquake Fund raising, One Year Later." From International Medical Corps, "Haiti One Year After the Earthquake." 11,603 Haitians educated on cholera prevention"
International Medical Corps, "Haiti One Year After the Earthquake." "Reaching out to an estimated 60,000 Darfurians - approximately 25 percent of the total refugee population - and 200,000 Chadians, International Medical Corps supports refugee camps and internally displaced persons settlements." International Medical Corps, "Chad." "Its health services benefit a population of 450,000 – 75 percent of them internally displaced– in West and South Darfur." International Medical Corps, "Darfur." International Medical Corps, "Emergency Response." International Medical Corps, "Health Capacity Building." International Medical Corps, "Women's and Children's Health and Well-Being." International Medical Corps, "Mental Health." International Medical Corps, "Clean Water, Sanitation and Hygiene."